In the spring and summer dresses are my favorite thing to wear. Partially because a beautiful dress draws out a certain confidence in women that very few other things can, and partially because you only have to think about one component of your outfit. 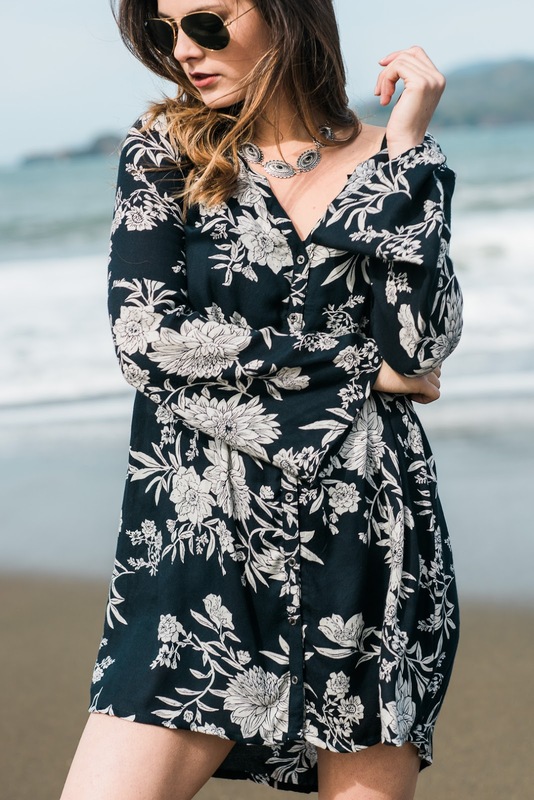 This loose fitting floral dress from Amuse Society via Top Shelf Style is a staple casual dress for spring, especially in SF. Whether you're going to a weekend brunch and pair this with a leather jacket and booties or for a beach day with gladiator sandals, this dress will become a go-to when you want to look effortlessly good. I have been partnering a lot with an up-and-coming boutique in SF called Top Shelf Style. I absolutely love online shopping and am arguably addicted to it, but I forgot how much I miss the physical process of shopping. I miss feeling beautiful unique fabrics, and trying on clothes only to find that one silhouette that fits your body perfectly. There are very few stores in SF that carry the brands and style that I like and Top Shelf Style hits the nail on the head so I'm so excited that I found them!